MORE than 10,000 earthquakes were recorded in Western Australia during the 12 months to June 30, 2002, a number of which rocked tall buildings in the Perth central business district. In the light of this and the fact that this state has the highest incidence of earthquakes in Australia, it makes good sense for the community to be aware of ways to minimise the impact earthquakes have on people and property. Ask your neighbours, State Emergency Service (SES), council and insurance company whether earthquakes have ever occurred in your area and what damage resulted. The Geoscience Australia website has information on recent earthquakes in Australia. If you live in an earthquake prone area, the following advice on ways to minimise the impact of earthquakes has been provided by Emergency Management Australia. Make sure chairs and beds are clear of hanging items such as ceiling fans, pot plants, paintings and mirrors. Brace freestanding furniture, such as bookshelves and water heaters. Store breakables, heavy items and hazardous liquids (such as pesticides, cleaning fluids and paint) on the bottom shelves of cupboards. Secure cupboard doors with strong latches. Plan together where your family will meet if separated by an earthquake. Learn about the safest area to be during earthquakes (see below). 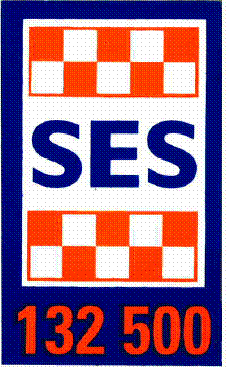 List emergency phone numbers for police, SES, fire, ambulance and gas, power and water suppliers. If indoors, stay there - clear of falling debris outside. Keep clear of windows, chimneys and overhead fittings. Shelter under (and hold) a doorframe, table or a bench. In high-rise buildings, stay clear of windows and outer walls. Get under a desk near a pillar or internal wall. In crowded areas or stores do not rush for the doors. Move clear of overhead fittings and shelves. If outside, keep well clear of buildings, overhead structures, walls, bridges, power lines and trees. In a city street, shelter from falling debris under strong archways or doorways of buildings. Don't go under awnings or parapets as they may collapse. If in a vehicle, stop in an open area until the shaking stops. Beware of fallen power lines, damaged roads (including overpasses and bridges) and landslides. Listen to your car radio for warnings before moving. Turn off electricity, gas, and water. Do not light matches. Check for gas or fuel leaks and damaged wiring. Check for injuries. Apply first aid. Do not move the seriously injured unless in immediate danger. Do not use your telephone immediately (to avoid phone line congestion) unless you need help for an emergency. Check for cracks/damage in roof, walls chimneys. Listen to the local radio and heed warnings or advice on damage, service disruptions and evacuation. Do not waste food and water as supplies may be interrupted. Avoid driving unless for emergency to keep streets free of unnecessary activity. Do not go sight seeing or enter damaged buildings.